The Lilo playhouse is an all-round playhouse with space for many children. In addition to two benches and a table, Lilo also has an extra bench on the veranda. Thus, there is plenty of room for playing inside, outside and around the playhouse. The playhouse’s kitchen can be found on the outside of the veranda. The kitchen has many small activities that train children’s fine motor skills while stimulating their creative and cognitive development. The floors in the Lilo playhouse are designed with a specially developed non-slip cubit-grain surface, and so the playhouse does not require a safety surface, and can therefore stand on grass. 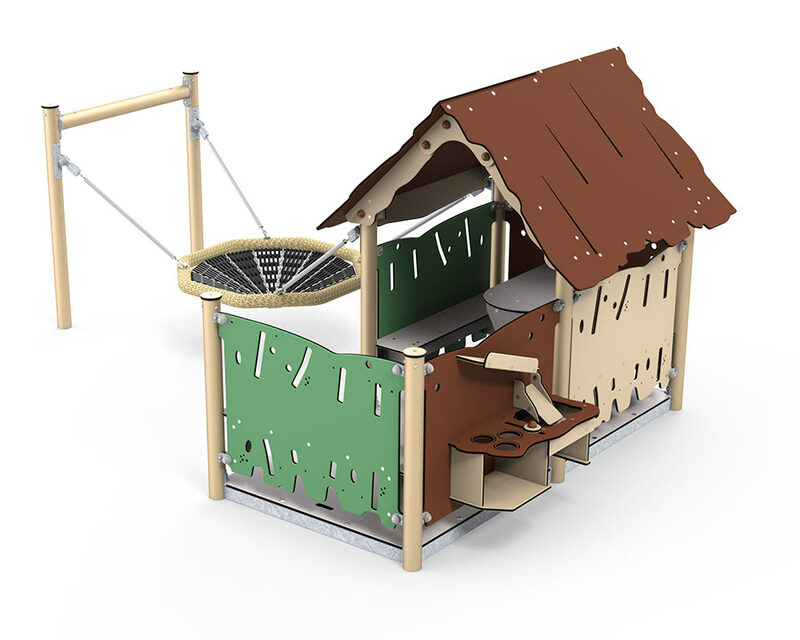 Lilo is also the only playhouse to feature a bird’s nest swing – or sensory swing, as it is also known. The bird’s nest is supported on both sides, and consequently it does not function as a real swing, but rather as a gently moving and rocking cosy corner, where secrets and tall tales can be told. The bird’s nest is particularly popular with younger children. When children lie or sit in the bird’s nest when it’s moving, it stimulates the vestibular sense inside the child’s inner ear. The vestibular sense registers the position of the head in relation to gravity – up, down, right, left etc. – and thus helps the child’s sense of balance.